Last week the MTO Summit brought together those in the meetings and event industry interested in how technology is impacting our industry. The event was kicked off with a keynote by Chris Brogan and Stephen Nold, who held a discussion centered on using Social Media to drive business. So many companies are using social media as a tool to drive awareness as opposed to driving business. The presentation covered best practices in everything from profile creation to business relations. Lots of good information on social media was discussed. The morning event also focused on mobile applications and discussed whether these apps really are adding value or they’re just an expensive technology distraction. By far and away, mobile has everyone’s attention though the utilization by attendees is still in the 5-10% range. The promise for mobile is great and everyone believes that is the future of content distribution. The afternoon sessions focused on ROI, technology for events, and attendee acquisition. Dave Lutz wrapped things up with an unsession with untraditional, unconventional elements and a glimpse at the underutilized expert – You! Overall, the event gave the industry a good sense of trends, technology and looked at what we can expect from mobile apps. Looking forward to the next event. North America’s largest exhibition of tradeshow products and services is taking place this week in Las Vegas – Exhibitor 2010. It’s a wonderful show with lots of great sessions, some of which qualify for CTSM credit. There are 70 new sessions – many focusing on topics like social media, virtual events, event measurement and the latest in products and services. Thursday, March 18th (3:00 – 4:30 p.m. R419) “RFID 101: The Basics of RFID and the Benefits of the Technology in Events. 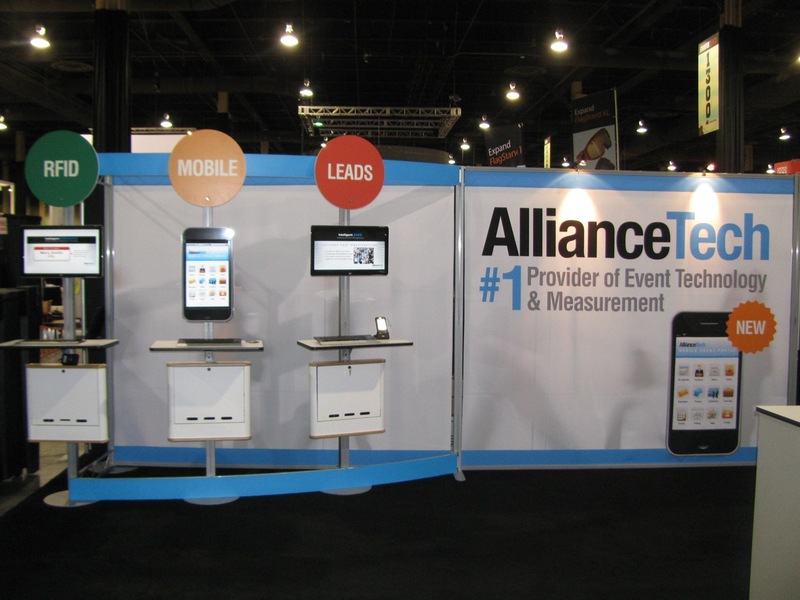 If you’re at the show, stop by the Alliance Tech booth # 1556. We’re going to be showcasing our event technology and measurement and would be happy to see you there. Yesterday I spoke at the Georgia Chapter of EDPA and TSEA on meeting metrics. Along with Jeff Masters from Philips Healthcare and Skip Cox of Exhibit Surveys, we participated in a panel discussion on how new technology and resulting metrics can drive an entire event marketing team to achieve ROI. The group was very interested in hearing and better understanding how to measure ROI using RFID, surveys and lead data. We looked specifically at Philips’ RSNA show and discussed the ways Philips used attendee behavior at the show to deepen its understanding of the attendee and meet show goals. Alliance Tech posted a Philips case study on this blog if you’re interested in more details of how Philips made the most of the RSNA show to benefit its business. A newly released study conducted by Maryland-based Shugoll Research on behalf of the Healthcare Convention & Exhibitors Association (HCEA), discussed what physicians really want from tradeshows. The survey shows that doctors consider tradeshows an important way to see everything related to their specialty in one place, at one time. They want their tradeshows to be staffed with knowledgeable experts who use educational techniques when demonstrating new products. Doctors want an experiential and invigorating environment underscored by low-pressure selling tactics. In other words, they want exhibitors to make going to the show a more enjoyable learning experience. These critiques can really help exhibitors revamp their exhibitions to make them more memorable, while increasing sales. When an exhibitor better understands the interests and preferences of physicians, they are more successful. With a little planning, on-the-floor measurement and evaluation, an exhibitor can maximize the value of their tradeshows for years to come. Here are some steps to capitalize on the feedback from this survey. Doctors expect to learn new information. The survey suggests doctors like an exhibition to be grouped by therapeutic or product area. Implementing RFID technology can help you determine the best way to arrange displays based on how much time an attendee spends at a particular display or within an area. Then, the display can be fine tuned, moved or phased out based on the booth configuration that generates the most interest and sales. Doctors want the show floor to be a networking opportunity. The survey noted that doctors like the idea of group selling so booth personnel should be fluent in engaging a group of doctors with common interests. This soft-sell technique will drive leads. When coupled with a customized lead qualification questionnaire, the sales team can better understand the budget authority of the physicians as it relates to their purchase intent. With the proper lead retrieval solution in place, exhibitors can measure cost per lead across all events they participate in. Doctors also want easier ways to navigate through the exhibit hall. With the request for Wi-Fi access, additional signage and information kiosks, attendees can have easier access to the areas and exhibitors they are most interested in visiting. By listening to the input from physicians and observing their behaviors with technology such as RFID, exhibitors can measure and understand their objectives, and generate higher quality leads. Every exhibition has a personality and by listening to attendees, exhibitors can expect to maximize their show investment.